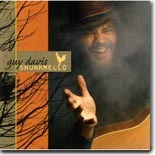 New York traditional blues guitarist Guy Davis has a new CD with a rather unique title of Skunkmello. It's this month's Pick Hit. Southern California label Delta Groove Productions has the find of the year with John Long, who went unrecorded for 35 years! His disc, Lost & Found, is our Surprise hit. Our Flashback for the month takes a look back at a wonderful classic, Fenton Robinson's Somebody Loan Me a Dime, originally released by Alligator in 1974. This month's What's New section features the new 35th anniversary collection from Alligator Records, 35x35, new releases from Jay McShann, Smokin' Joe Kubek, Sue Foley, Omar & the Howlers, Sugar Pie DeSanto, Phil Guy, and Popa Chubby, plus DVDs from Otis Rush and the combo of Jay Geils, Duke Robillard and Gerry Beadoin.